C. W. Post told his daughter in so many words, “Don’t let the money rule you . . . don’t let it possess you.” C. W. was the Post of Post cereals, General Mills, and C. W. Post College just to name a few of his notable accomplishments. His daughter was none other than Marjorie Merriweather Post who was nothing if not an obedient daughter of privilege who lived her life with maximum éclat and grace among surroundings befitting American royalty. Ingenue to Icon pays tribute to one of America’s most stylish and famous personalities. Marjorie Merriweather Post was born into this world and lived a life according to her station, but she was no Barbara Hutton. To say that Marjorie was just rich was like saying Balenciaga pinned hems for a living. Ms. Post was unique in that she understood what it meant to give back and pay it forward way before those expressions were part of our vernacular. Aside from her penchant for estates, staffs, business, gems of astounding scale, and a string of well-heeled husbands, Marjorie Merriweather Post had a lifetime love affair with her wardrobe. She was meticulous about cataloging and curating her clothing as any scientist might be of recording his or her discoveries. Ingenue to Icon is a biography of Marjorie Merriweather Post that starts out in a narrative and then her life and this book unfold in a far more visual way. Ms. Post was an astute business woman as well as highly organized in every facet of her life, but then again she had not much choice with a 54-room apartment complete with staff, a yacht with a staff of 72, and assorted estates. She was also an integral part of General Mills and high society. It was due to her vision and her abilities that her wardrobe has been so well documented and preserved. Her sartorial flair, acquisitions, and accomplishments will outlive her for generations and serve as lessons in style and fashion history. What needs to be taken into account here is that the majority of Marjorie’s wardrobe was haute couture. Everything from the shoes up had been made to measure either by private designers or within the rarefied confines of made to measure salons of Bergdorf Goodman, Bonwit Teller, and assorted other retailers. Ingenue to Icon serves a tutorial in fashion history as well as a catalogue of Ms. Post’s affection for and attention to the world of fashion. The clear message is that Marjorie was no fashion victim, but clearly she was a clotheshorse who understood the silent signals that are transmitted by how one presents him- or herself in public. 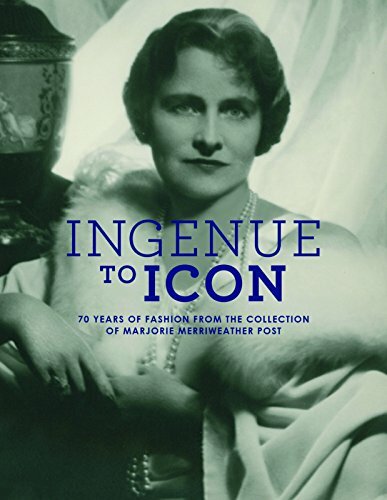 Ingenue to Icon is a book that can be appreciated on so many different levels as is most appropriate given the multidimensionality of Marjorie Merriweather Post. The book is a visual diary or chronicle as well as a great source of insight into what it was to be as rich as she. Ingenue to Icon is a historical work with a focus on one woman’s life as told through her sartorial choices explained in an engaging narrative.